When people ask, “What is photography?,” it’s not scientific principles and concepts that come to mind, but the simple use of this modern technology to make a permanent record, not only of famous events and persons, but also the private moments in the lives of billions of individuals and families around the world. This has only been possible for less than 200 years. For hundreds, even thousands of years previously, only a few great leaders and events were captured in a limited number of sculptures, paintings and illustrations. On rare occasions, the “common people” were featured in paintings and drawings, but most of these were only during the last 300 years or so. It was accepted knowledge among many scientists before the 19th century that specific silver compounds, now known as silver halides, would become black when exposed to light. It was during the early 19th century in England that Thomas Wedgwood first experimented with silver nitrate to cause this effect. He was able to “photograph” silhouettes of subjects, but unless they were kept in a dark place, the images were true to the principle and turned black. The next step in the search for what is photography occurred when Niepce entered into a partnership with Louis-Jacques-Mandé Daguerre, another Frenchman, who had been experimenting with silver iodide. Their work led to what would become the first, true photographic process known as daguerreotypy. A silver-coated sheet of copper was treated with various chemicals before being exposed to light in a camera. It was then developed in much the same manner, as film would be during the 20th century. Although the process was complicated and required exposures of several minutes in bright sunlight, it became very popular in England and the United States, as a technique to create portraits. The French used daguerreotypy to photograph landscapes and cityscapes. William Henry Fox Talbot was also conducting simultaneous experiments in England looking for the elusive secret to what is photography. Instead of a sheet of copper, he used a piece of paper impregnated with silver nitrate. This process resulted in a negative image of the scene or subject, which could then be transformed into a positive image by placing the negative on another piece of impregnated paper and exposing them to light. Talbot’s images were not as sharp as Daguerre’s, but Talbot could make a number of prints from a single negative, which Daguerre was unable to do from his copper plate. 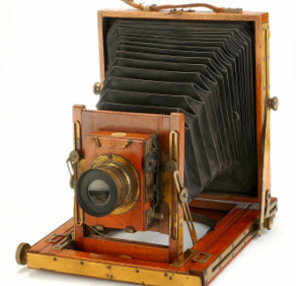 F. Scott Archer, another Englishman, was responsible for the next major advancement in photography when he developed his wet-collodion process. Instead of Daguerre’s copper plate or Talbot’s paper, Archer used a glass plate also coated with silver halides. Although Archer’s process was almost as complicated as daguerreotypy, it was much less expensive, and created a sharper image than Talbot’s method. Archer’s glass plate had to remain wet to be light sensitive, but this resulted in the development of the first mobile darkroom, so photographers could prepare the plates just before exposing them. This would prove to be an important step in discovering what is photography because the first photographers to use it as a mass communication tool would be able to take pictures in remote locations.